Nick (Mike Pantozzi) gets his girls the same way he gets his music: online. 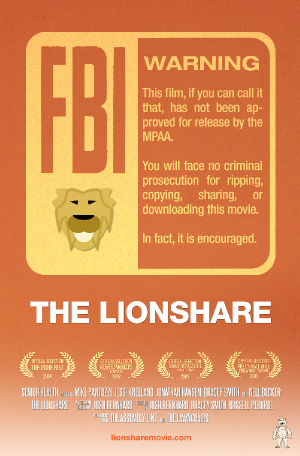 On a first date, Eva (Jessi Kneeland) invites him to an exclusive filesharing community called ‘The Lionshare’. From there, Nick’s own creative frustration fuels his consumption of pirated music and other media while he produces nothing of his own. Eventually, he finds inspiration in the unlikeliest of places. The Lionshare is the debut feature from writer/director Josh Bernhard. It was made in the spirit of the independent, do-it-yourself cinema of the Internet age, shot with consumer video cameras at the cost of a few thousand dollars. The latest in a wave of films dubbed “The New Talkies,” its kinetic style and raw performances recall the work of John Cassavetes and the DOGME 95 movement. Relying on naturalistic dialog and a barebones aesthetic to match the bare honesty of its characters, The Lionshare is a personal look at life and love in an increasingly impersonal world. The movie is a reflection of how we are living now, as we increasingly relate to each other through the music we listen to and the media we consume; where people communicate through internet memes and pop culture references. The Lionshare demonstrates how the medium has truly become the message.